For those of you who have are looking out for a heart rate monitor, chances are you would have come across a fair number of models that aren’t as small as the one you see here. In fact, this one is so tiny in comparison, it will fit into your pocket all too easily, leading you to lose it in an instant as well if you aren’t too careful. 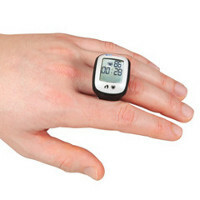 We’re talking about the Heart Rate Ring, and since it is called a ring, why not slip it over your finger for convenience’s sake? After all, this is where it is meant to be – to be as unobtrusive as a class ring while providing pulse readings without the need for an uncomfortable chest strap. The device will slides on your index finger in a jiffy, displaying an EKG accurate reading on its LCD with the touch of a button. Of course, another advantage of this device would be to have it set to an audible alert whenver your heart rate exceeds or falls below a preset optimal beats-per-minute target zone, letting you know when to increase or decrease your pace. Powered by a sole CR2032 battery, it is also capable of calculating calories burned, steps taken, and distance traveled. This makes for a nifty clock as well, and might be one of the better $49.95 you would have spent to date. hey, this is a nice product.. my grandma is a heart patient, this could really help her out..